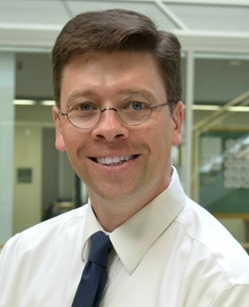 Stephen McAleavey is an associate professor of biomedical engineering. He earned the BS and MS in electrical engineering from the University of Rochester in 1996 and 1998. He received the PhD in electrical and computer engineering from the University of Rochester in 2002. From 2001 to 2004 he was a postdoctoral research associate in biomedical engineering at Duke University. At Duke he contributed to the early development of ARFI imaging. In 2004 he joined the faculty of the biomedical engineering department at Rochester. Here he has continued to develop acoustic radiation force imaging techniques, for which he holds two patents, including Spatially Modulated Ultrasound Radiation Force (SMURF) imaging, as well as other ultrasound imaging methods. He teaches two courses: a junior-level course in Signals, Systems and Imaging (BME 230) and a graduate level course in Ultrasound Imaging (BME 453). The development of novel, clinically applicable ultrasound imaging techniques is the primary goal of our laboratory's research. We are particularly interested in the use of motion-tracking techniques to enhance the contrast of ultrasound images. Motion of tissues, both physiological and artificial, can reveal the differences in tissue stiffness and type, as well as the presence of implanted devices. Furthermore, detection and tracking of tissue motion can guide the delivery of therapeutic agents. The interaction of ultrasound with tissue, statistical properties of ultrasound echoes and signal processing techniques are the topics we study in order to achieve these goals. Acoustic Radiation Force Impulse (ARFI) imaging is one technique we are investigating. ARFI imaging uses short (<0.1ms) bursts of ultrasound to induce small but measurable (2-20 microns) displacements in tissue. The response of the tissue to this impulsive excitation is determined by material properties. By measuring this response we produce images with contrast not present in ordinary ultrasound images (B-scans). Magnetically induced vibration of brachytherapy seeds, combined with ultrasonic motion tracking, allows us to produce high contrast images of brachytherapy seeds embedded in tissue. Brachytherapy seeds are ordinarily difficult to image with ultrasound, and their accurate placement is necessary for effective therapy. Our magnetically induced motion imaging (MIMI) technique could serve as an enabling technology for real-time treatment planning of prostate brachytherapy.